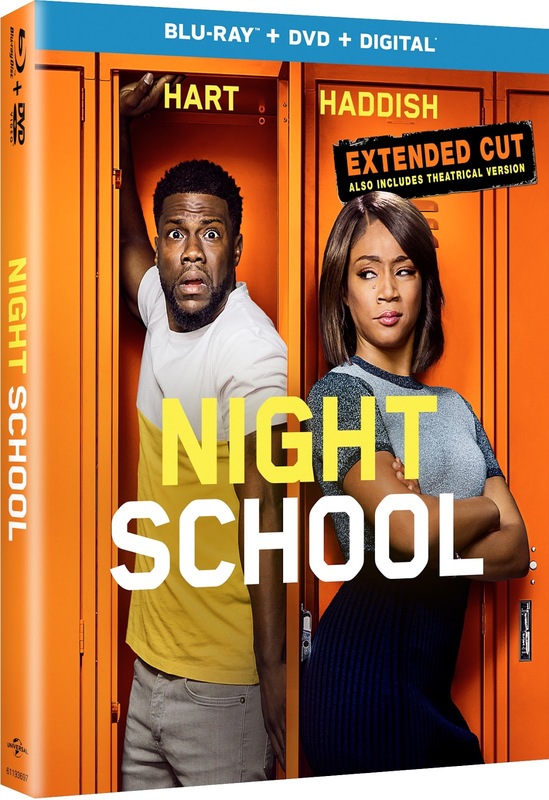 It's been a long while since my last review on a movie, so I was super excited to get the opportunity to get to watch Night School. It stars one of my favorite comedians, Kevin Hart, along with Tiffany Haddish, who is making her way up to the top. Both are extremely hilarious in this movie from beginning to end. The story-line is not only well written, it's hilarious and well cast. Both Kevin Hart and Tiffany Haddish make a great comedy duo and bring their A-game with their own comedy twist. You'll be laughing from start to finish. Not only is this a great comedy, but it also leaves you with a great message in the end to never give up. This is one of the things I love most when I watch anything that Kevin Hart is in. I'd definitely recommend checking out this movie if you haven't already watched it. Out now on blu-ray and DVD, I am thrilled to be able to offer one lucky winner a chance to get their own copy, enter below! That was one of my favs too! Absolutely loved it. I like This is the End! Oh man hard to pick one Kevin Hart Movie, Get Hard was pretty hilarious though , so was Jumanji welcome to the Jungle . Any movie he is in I love it . Kevin Hart was at his best in Jumanji. Tiffany Haddish is so funny! This movie looks like fun. My favorite Tiffany Haddish movie is Nobody’s Fool, and Kevin Hart’s movie is Ride Along. Night School is a funny movie, I definitely want to see it again! I like Ride Along movie. i really liked Ride Along! Love Kevin Hart Jumanji is my favorite!! This looks so hilarious, Kevin Hart is so funny! Can't wait to watch this! Get Hard was so funny. I don't remember seeing any Kevin Hart or Tiffany Haddish movies. (I guess I don't get out much - lol). I would like to see Night School though. There is many Kevin Hart movies that I like he is just so funny, but I do have to say I really enjoyed him in Jumanji! I really enjoyed Central Intelligence! Jumanji welcome to the jungle but I like pretty most of his movies! I actually REALLY loved him in The Upside! I liked Kevin Hart in the movie Get Hard. It was hilarious! Girls Trip was hilarious. I really enjoyed it. I liked Jumaji and Central Intelligence. I loved Kevin Hart in Jumanji! I hadn't really seen him in other stuff before that. I like the movie Get Hard the best. I love Kevin Hart in Jumanji! And any IG post with him & Dwayne Johnson, LOL! We all absolutely loved him in Jumanji. He was the perfect person to portray the character. I just saw him in The Upside. I really like Ride Along. Girls Trip with Tiffany Haddish was really funny! My favorite Kevin Hart movie is Ride Along. I really like Girls Trip. I really liked Kevin Hart in the Wedding Ringer!! Kevin Hart in Jumanji was really good! Ride Along is my favorite Kevin Hart movie, but I really want to see his new movie The Upside.